Dental implants are a comprehensive tooth replacement that can help you enjoy a complete, beautiful smile for a lifetime after tooth loss. The procedure is completed over the course of two major phases: placement and restoration. Keep reading to learn more about the difference between the two and what you can expect along the way. We cover placing vs. restoring implants in Memorial in full detail! What Happens during Dental Implant Placement? Placing dental implants in Memorial is the first phase of the procedure — and also the most complex. This is the surgery in which the implant posts are placed strategically beneath the gum line into the area where the missing tooth’s root structure once was. Implant placement requires plenty of planning. Your implant dentist or oral surgeon will take X-rays and scans of the jaw to determine precisely where the post(s) should be placed. Once the treatment plan is in place, the implant placement will be scheduled soon after. The procedure for implant placement occurs under local or general anesthesia, depending on patient preference and the complexity of the case. Sedation may be combined with local anesthesia for maximum comfort and relaxation. Once you are completely comfortable, the gum tissue will be opened and the implant post will be placed according to the specifications of your treatment plan. For traditional dental implants, the gums will then be closed once again and healing begins. You may wear a temporary tooth replacement during the recovery if needed. What Happens during Dental Implant Restoration? Dental implant restoration occurs once the implant posts have fully healed together with the jaw bone. 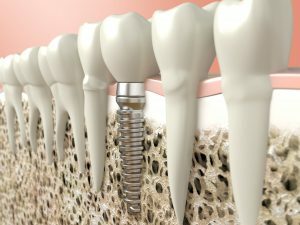 This process, known as osseointegration, takes 4 to 6 months and creates a sturdy foundation for the new tooth replacement which will be placed on top. During this second phase, the implant posts will be exposed once again and a connecting abutment will be placed to each one. After another brief healing period of one to two weeks, you return to the office and the crown, bridge, or denture is affixed onto these connecting abutment(s). In total, the procedure for dental implants can take up to 1 year to complete. What Else Should I Know about Dental Implants? Dental implants are far and away the best method of replacing any number of missing teeth. Yes, they take a while to complete and you may have to visit the dentist several times throughout the process — but nothing else provides a long-lasting solution that also promotes oral and overall health like dental implants. Whether you are missing one, two, or an entire arch of missing teeth in the upper or lower jaw, don’t wait to find out whether or not you are eligible for dental implants. Mark Gray DDS and his team offer comprehensive dental care from their modern, updated dental practice. Comprehensive dental implant care means you can count on Dr. Gray for every aspect of the implant procedure, from placement to restoration. To learn more about dental implants in Memorial or to book a visit, do not hesitate to contact the office at 281-493-9395.